In this artist's rendering, a disk of material has formed around a supermassive black hole after a star was shredded by the cosmic beast. 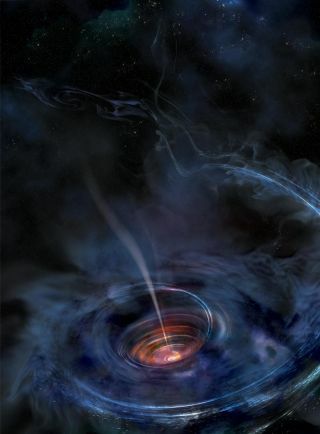 The material heats up as it falls toward the black hole, and flashes of X-ray light near the center of the disk result in light echoes that allow astronomers to map the structure of the funnel-like flow. Using these light echoes, new research has revealed strong gravity effects around a normally quiet black hole. A sleeping giant at the center of a galaxy has awoken: A normally dormant, monster black hole has been found shredding a star that ventured too close to the cosmic beast. This stellar slaughter was spotted by scientists who study the X-rays bouncing around the swirling disk of matter surrounding the giant black hole. The method used to analyze this event — named Swift J1644+57 — could help solve the mystery of how the largest black holes in the universe grew to such enormous sizes, the authors of the new research said. Although nothing can escape a black hole after falling inside, not even light, it's possible for material around a black hole to radiate light that astronomers can see. Violent motion within the so-called accretion disks, the expanses of gas and dust swirling around black holes, can generate bright flares of light, as well as jets of material that shoot away from the black hole at nearly the speed of light. Most of what astronomers know about supermassive black holes comes from studying black holes that are actively devouring or accreting matter. However, these active giants make up only about 10 percent or less of supermassive black holes, the authors of the new paper told Space.com. In contrast, about 90 percent of known supermassive black holes are dormant, meaning that they are not actively consuming matter and, consequently, do not give off any detectable radiation. However, sometimes a star drifts too close to a dormant black hole, and the star's ensuing destruction, known as a tidal disruption event, triggers spectacular fireworks. These cataclysms can provide astronomers with information about this vast population of mysterious supermassive black holes. Any details from dormant black holes are potentially valuable to astronomers in their efforts to understand all types of black hole activity. Scientists would especially like to understand the rates of spin for both active and dormant supermassive black holes. This is because scientists have different theories about how black holes grow in size, and these different ideas predict different spins for the black holes, study lead author Erin Kara, an astrophysicist at the University of Maryland, College Park, told Space.com. "For instance, if black holes grow mostly by accretion of material through an accretion disk, then we would expect the black holes to be spun up over time, and then most of the black holes in the universe should have maximal spin," Kara said. "By contrast, if black holes grow only by mergers of smaller black holes into larger ones, then we should expect a more random distribution of black hole spins." Previous research into the light from active black holes revealed that many of the objects are spinning rapidly. Astronomers now want to measure the rate at which normally dormant black holes whirl; this will help researchers get a more complete picture of black hole spin, Kara said. For the new research, Kara and her colleagues examined a black hole that was caught in the act of swallowing a star that got too close (the first such discovery), using old high-energy X-ray data from NASA's public archives. Swift J1644+57, first detected in 2011, happened about 3.9 billion light-years from Earth in the direction of the constellation Draco. "Most tidal-disruption events don't emit much in the high-energy X-ray band. But there have been at least three known events that have, and this is the first and only such event that has been caught at its peak," Kara said in a statement from the University of Maryland. "NASA's Swift satellite saw it first and triggered the European Space Agency's XMM-Newton satellite and the Japanese Aerospace Exploration Agency and NASA's Suzaku satellite to target it for follow-up. So we have excellent data. We're lucky that the one event we have is showing us all these exciting new things." The researchers used a new technique called X-ray reverberation mapping to chart the inside of the black hole's accretion disk. This method resembles how dolphins and bats map their surroundings by emitting ultrasonic waves and measuring the amount of time it takes for the echoes to return. In X-ray reverberation, the astronomers investigated small delays in the arrival time of X-rays emitted within the disk that reflected off iron atoms in the disk. "We know how sound echoes in a large auditorium, for example. Because we know the speed of sound, we can use the time-delay information to calculate the shape of the auditorium," Kara said in the statement. "We are doing the same with X-ray radiation to map out the inner accretion disk. It's a cool, novel technique that has only been developed within the last six years." This new kind of analysis suggested the black hole is a few million times the mass of the sun. "The thing for me that was most surprising was that it actually worked," Kara said. "X-ray reverberation mapping was not developed for looking at tidal-disruption events, but we had an idea to try it out, and now it seems to be a promising way of understanding tidal-disruption events." In addition, the scientists unexpectedly discovered that the X-rays appear to come from deep within the accretion disk, very near the black hole, Kara said. Conventional wisdom among astronomers has long held that, during a tidal-disruption event, high-energy X-rays are created further away from the black hole in the relativistic jets — powerful bursts of particles ejected from the black hole at nearly the speed of light. Furthermore, the researchers found the black hole was gorging on the star at a rate 100 times greater than a theoretical maximum known as the Eddington limit. This is the point at which the energy given off by matter rushing toward a black hole should curb the amount of matter feeding that black hole. Increasingly, research suggests black holes can overcome the Eddington limit for so-called super-Eddington growth rates. "In the case of Swift J1644+57, we think it can exceed the Eddington limit because most of the radiation is funneled out preferentially in one direction," Kara said. "Meanwhile, material is accreted inwards at very fast rates, unimpeded by the strong radiation force." So far, Kara and her colleagues have not actually been able to use X-ray reverberation mapping on a tidal-disruption event to measure dormant black-hole spin. Still, they say the method could directly measure the speed and direction of dormant black-hole spin in the near future. "Just as importantly, we can follow along after an event and watch how the accretion disk spins down and energy dissipates as the black hole returns to a quiescent state," study co-author Chris Reynolds, also at the University of Maryland, College Park, said in the statement. "We might finally be able to observe all of these various states that, so far, we only know from theory textbooks." In the future, the researchers want to attempt X-ray reverberation mapping on additional tidal-disruption events. "We just need to wait for them to happen," Kara said. "We've been waiting since 2011 for another one like Swift J1644+57." The scientists detailed their findings online June 22 in the journal Nature.